-- Cording, Yarn, etc... for gathering your fabric. Figure out how long you want the skirt to be, by holding the top (1" side) of the measuring tape at your natural waistline. Remember to add about an inch for the waist and 2 inches for the hem. Example: Waist to hem (27") + Waistband (1") + Hem (2") = 30"
For your waist band: measure your waist and add about 1 inch, divide that number by 2 and you will get the length measurement. The width of the waistband is up to you, just make sure to add about 2 inches for folding on either side. Do you like this type of tutorial? If you do, would you like to see more videos? Also, would you be interested in a sewing video series on where I share my tips, resources, patterns, etc...for beginner sewers? Before I forget, remember that coupon code I shared with y'all around Christmas time for Better Dresses Vintage? Well, that coupon code is back, 10% off any order from Better Dresses Vintage using the code: Bramble10 at checkout. Than you so much for this tutorial. 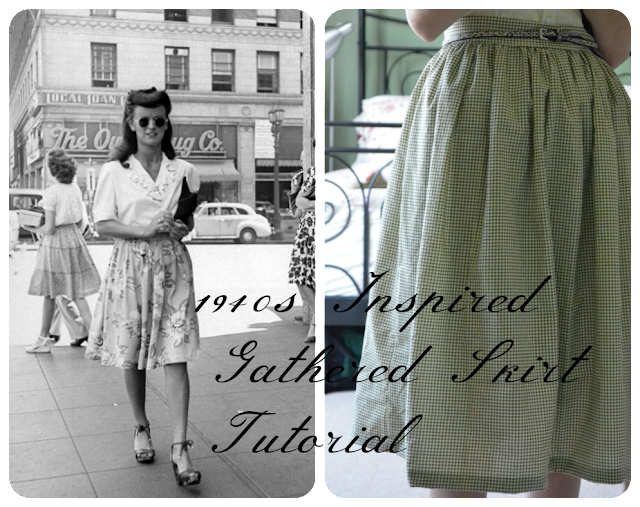 Love that skirt and can't wait to make one. Thanks for the tutorial Ashley! I never used cording before (or even heard of using it for gathering!) What a brilliant idea though! The other gathering techniques I tried were complete flops and left me with threads everywhere and holes! yikes! Hopefully my skirt will turn out as cute as yours! I can't wait to start up my machine!